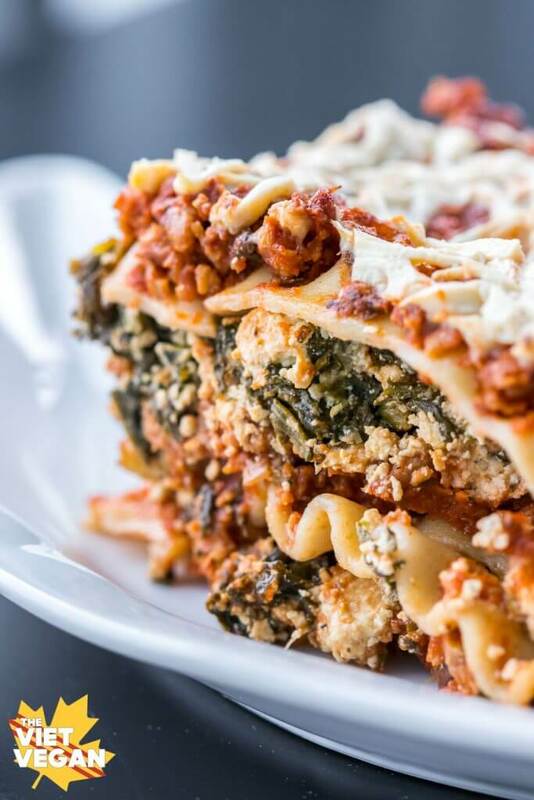 This vegan lasagna is the real deal—hearty, full of protein and a vegan spinach ricotta. 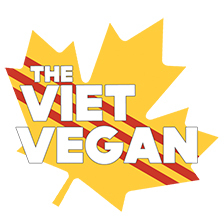 Despite the fact that I call myself “The Viet Vegan”, there are many aspects to me that are very Canadian. Having grown up here, I experienced a bit of both worlds—some Canadian and some Vietnamese. There was a period of time where it was just me and my mom at home. I think I was 13 then. I didn’t realize it at the time, but my mom spent a lot of time working trying to support the two of us and I spent a lot of time home by myself reading or writing fan fiction because I was that kind of nerd. I ate a lot of TV dinners and boxed lasagna, which I was 100% okay with at the time, mostly because my mom didn’t have the time or resources to go to Toronto to get Vietnamese groceries. There are so many things we don’t realize that our parents do for us when we’re younger. 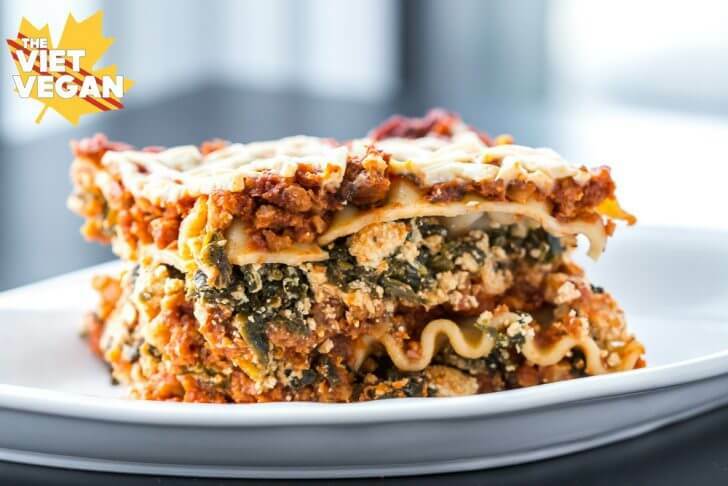 It wasn’t until I made this vegan lasagna and was feeling nostalgic that I realized that I ate these kinds of TV dinners and frozen meals because she was working so hard for us. It’s so fascinating to rediscover these memories or re-see them through my mother’s eyes as I make these foods I once loved. In a medium pot over medium heat, cook diced onion in oil until lightly browned. Add 1 1/2 jars of tomato sauce (maybe lower the heat to reduce splattering) and heat through. Add beefless crumbles and cook until just heated through. Set aside. Mix to combine lemon juice, tahini, white miso, nutritional yeast, and garlic powder. Crumble in the tofu and mix well to combine. Defrost the frozen spinach and add to the tofu mixture. Stir well to combine. Cook pasta noodles according to the package and drain well. Spread some of the sauce reserved from that 1/2 of the jar on the bottom of a 9x13 glass casserole dish. Cover with aluminium foil and bake for 30 minutes covered, then 15 minutes uncovered. *I used one that had herbs in it, but you can add 1/2 tsp each dried oregano, thyme, and parsley to add extra flavour. Also, if you'd prefer not to use the beefless crumbles, you can leave them out completely, but if you want a nice, bulky lasagna I'd recommend adding cooked lentils, TVP, or beans. Don't care about it being gluten free, but as a vegan this looks amazing, and soooo easy. Will definitely be trying it. Thanks for the recipe :) Nice photos too!! I'm in love with your recepies. Specially this one. Can not wait to get home and cook it!!! Made it. Tweaked it. LOVED IT!!!! Thank you so much for the awesome recipe! We are all so stuffed- was amazing!!!! I tried this recipe and it tasted absolutely great. My boyfriend isn't a fan of vegan cheese or beef less crumbles, I wish he had liked it, but I truly did, thanks for sharing this. ZumWohl loves lasagna when it is vegan. Looking forward to making this one. Thank you. I'm new to making vegan dishes and honestly wasn't that excited to eat it, but after my family and I did we all agreed it tasted delicious! Would make again. Thanks for the recipe. Added some fresh garlic and mushrooms to the sauce. Can you assemble and bake with uncooked noodles? If so does it change the time at all? Just became an almost Vegan...I still love cheese! I cannot eat meat anymore because it hurts my stomach. I still LOVE Lasagna...and this recipe looks amazing. Can't wait to try it! Made this tonight exactly as you instructed and it was delicious! My boyfriend and I are calling it a definite make-again. Thanks for the awesome recipe! Made this tonight, was very very good.We could not tell this was vegan. If you really wanted to hide the fact this was vegan you could sprinkle some real cheese on top and then sit back and wait for people to guess it does not have meat.Very good recipe - thank you! Hahha well I'm glad you enjoyed it! I wouldn't recommend adding cheese on it though, just tell people its a veggie lasagna :) It's like the ones I used to buy at the store! Just made this and at two huge pieces! So delicious and will definitely make again. You are making my transition to veganism so much easier! That was one of the first docus I watched when I started my vegan journey :) I'm pretty sure I buy all my tofu organic, not intentionally but most of the soy products I see are organic anyway. I made this a couple weeks ago and we loved it. I was wondering if I could make two this week - one to eat and one to freeze? Hmmm I've never tried it myself but I don't see why not! We take this lasagne to dinner parties with omnivores and everyone ends up asking us for the recipe. So good and most people can't even tell it's vegan. Thank you, Lisa! Well, it's in the oven and it smells good! I'll let you know how it tastes. I think I combined your recipe with Cheap Lazy Vegan recipe. The last time I made vegan lasagna, I used the no boil lasagna noodles and didn't have near enough sauce and it was kind of dry. Tonight I made double the sauced, but used noodles you have to boil. Hope I didn't over do it on the sauce. Anyway! Very excited to try this! 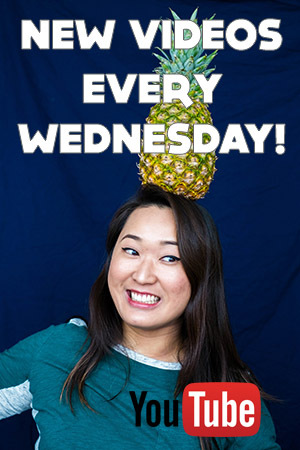 Anything you can sub for miso? Or could you leave miso out? Hi Lisa, I made your lasagne last weekend and had the leftovers yesterday. I think it is a very good recipe. I adapted the ingredients for the ricotta because for me it needed much more extra's to get it tasty, but I always need to do this when using tofu. I think I at least doubled the miso, nutritional yeast and of course added quite some salt and pepper. No problem, it turned out great! I used Vegusto Classic cheese. Yummie. This lasagne turned out really firm so I could slice beautifull pieces that stayed well on the plate. Thank you for the recipe!